The following are some of the contents. 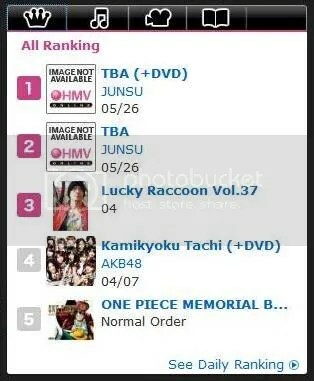 will release on May 26 two versions of the solo single album (with/without DVD). 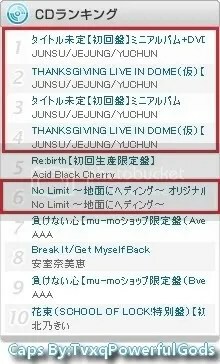 The title and details are not announced yet, but as Tohoshinki, he has charmed us with his performances with many songs, so our expectations are rising to its limit. Junsu’s vocal was highly appraised from his childhood days, and he was called “a child prodigy”. This single is full of his vocals, and is a double titled single album. On of the songs is a song with an adult’s atmosphere, and the other is a ballad song which you can find Junsu’s true value. 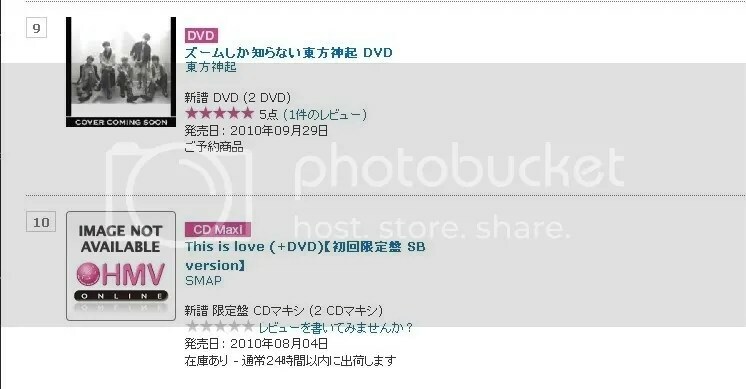 For the DVD plus version, there will be a video clip of the songs, and in the first release, there will be an approximately 10 minutes’ offshoot movie. 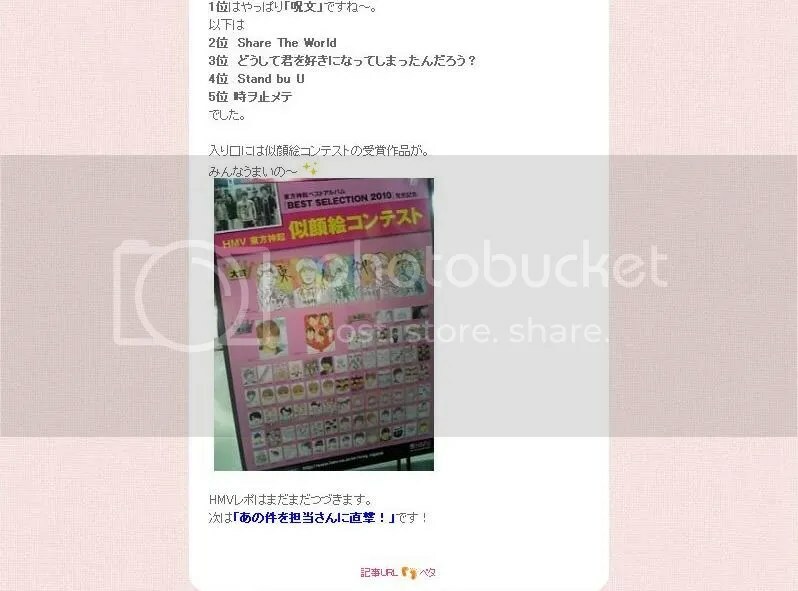 For both the first released limited DVD + CD and CD versions, there will be a jacket card enclosed with the product. The first release should be immediately sold out, so for those who want the album, we would recommend that you to make the reservations. Wonderful vocal, wonderful dancing skills, and full of humor off stage. 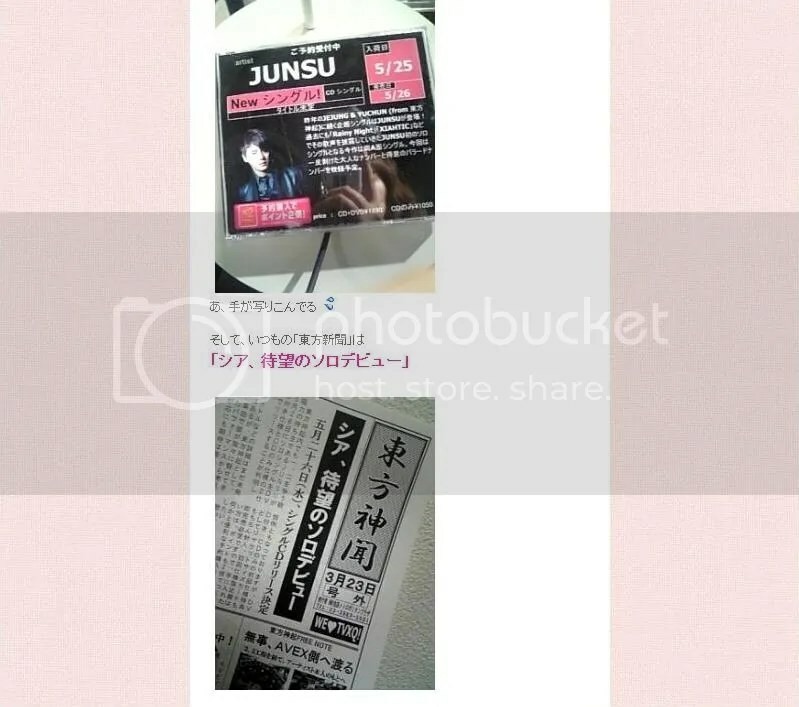 you should fall for Junsu with this opportunity! 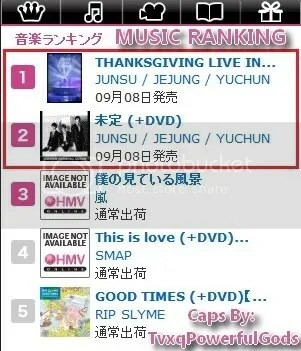 For those who will hear Junsu’s song for the first time, our recommendation is “Asuwa Kurukara”. It is a comfortable and cozy ballad. The highlight is the solo part after the second chorus. Junsu’s dynamic and also soulful vocals will echo in your ears. You cannot talk about Junsu without hearing this song. This is a questionnaire about “Tohoshinki’ Best Songs”. I love where they have written “投票神起!”, lol. (T/N: 投票in Japanese is pronounced “Tohyou”, similar to “Toho”. 投票means “voting”. 3rd place: Doushite kimiwo sukini natte shimattandarou? There were the prize-winning works of the portrait contest. 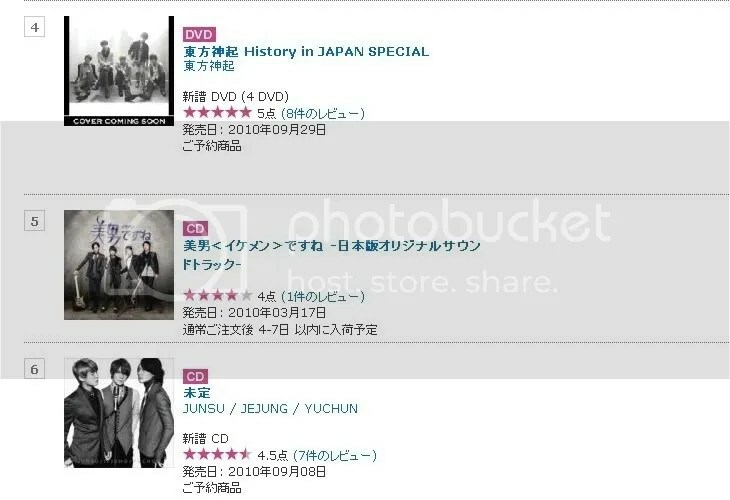 Tohoshinki have successfully released their first album ‘Best Selection 2010’ last month, to incorporate with the release, HMV had organized a ‘TOHOSHINKI Portraits Contest’ from 16th February to 5th March 2010 at 57 outlets in Japan. Total of 600 work piece were submitted. HMV had gone through tough audition for all the submitted work and had finalized the 1st and 2nd winners together with 54 special prizes for all HMV outlets respectively, which make up of 57 prizes all together. All winners will receive a ‘HMV Gift Card’ that can be use at all HMV outlets, and their work piece will also be displayed. 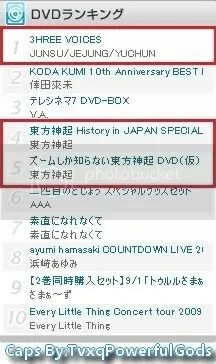 On top of that, March 2010 is the high release peak for Tohoshinki with the releasing of ‘TOHOSHINKI VIDEO CLIP COLLECTION – THE ONE’ on 17th March, ‘4th LIVE TOUR 2009 – THE SECRET CODE’ Blu-ray Disc, ‘TVXQ – NONSTOP – MIX VOL.2’ and their 30th single ‘Toki wa tomete’. 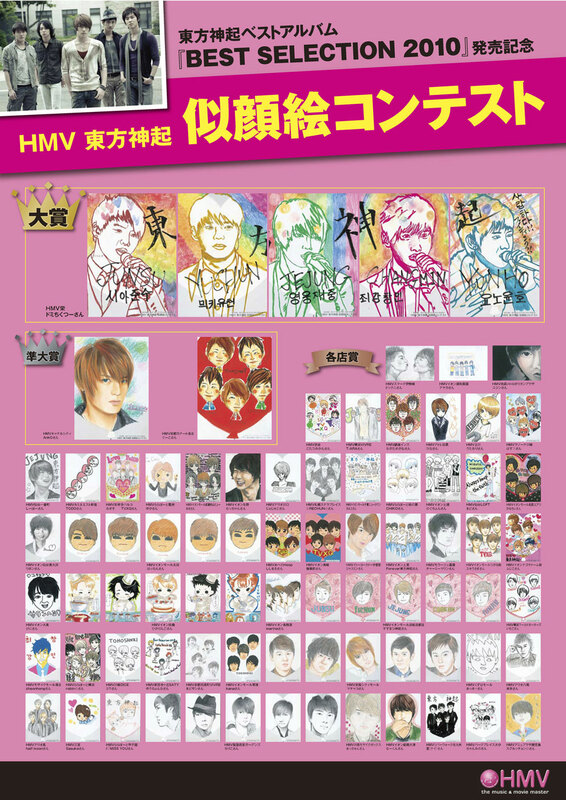 To commemorate these releases, HMV will be holding an exhibition of Tohoshinki precious signature posters and panels at Ikebukuro City Square at April. 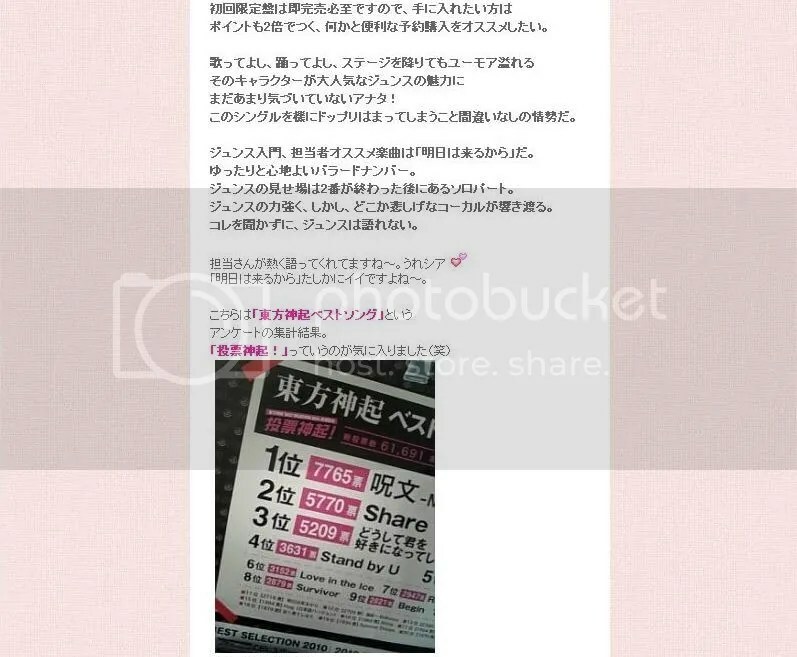 TVXQ Awareness Survey give to around 3800 HMV users. TVXQ’ charm divided between “Teamwork (36.9%)” and “Vocal talent (34.1%)”! 48% of fans spend 2~3 hours on TVXQ-related activities every day! The most times one fan visited Korea was 40! 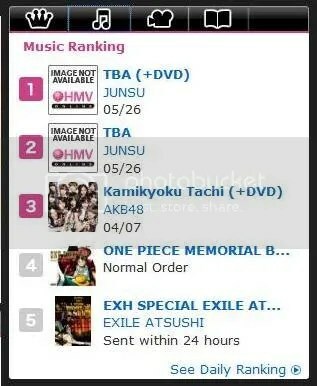 TVXQ will be releasing their first best album “BEST SELECTION 2010″ on February 17th. 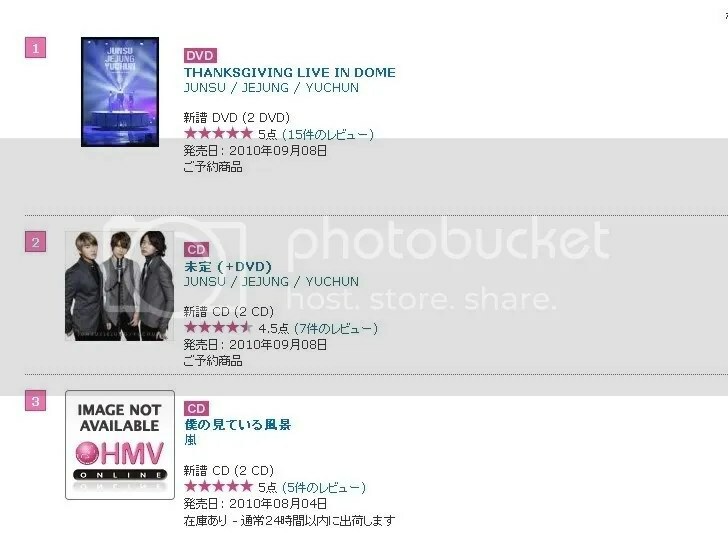 To commemorate the release, HMV Japan Corporation used HMV ONLINE (http://www.hmv.co.jp) abd HMV MOBILE (http://m.hmv.co.jp) to ask approximately 3800 HMV users on their awareness of TVXQ with a “TVXQ Awareness Survey (http://www.hmv.co.jp/pr/tohofan/). 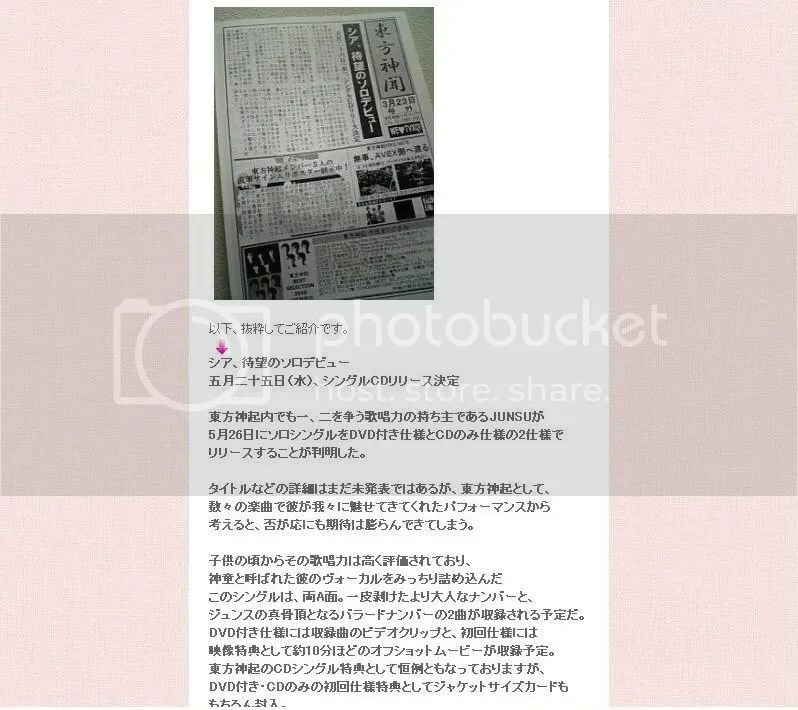 Super group TVXQ debuted in Japan in 2005 and became top artistes there. 98% of the survey takers were women, so the results were heavily biased towards females. However, the age of the survey takers ranged from those in their teens to those in their fifties, proving that TVXQ had a fandom that crossed over generations. It was voted that TVXQ’s biggest charms that sucked in fans was “Teamwork” (36.9%) and “Vocal talent” (34.1%). “Good looks” only made up 1.3% of all the answers. 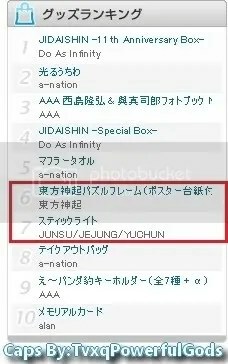 The main method in which people found out about TVXQ was “TV” (60.0%); other answers included “Through their CM songs”, “Through their drama opening songs” and “Because Sekine Tsutomu recommended them”. Regarding time spent on TVXQ-related activities, the majority said they spent 2~3 hours every day on such activities (48.4%). 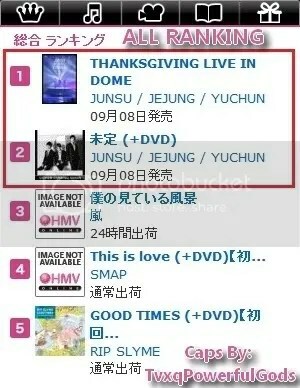 However, 5.1% stated that they spent at least 10 hours on TVXQ related activities every day. 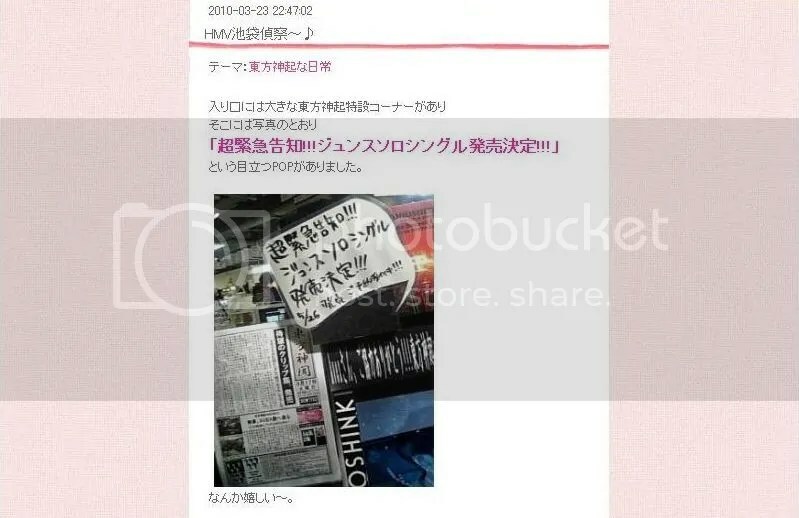 A large portion of the survey takers replied that they found out about TVXQ “Online” (38.4%); other answers included “TV”, “Magazines” or “From a friend or someone I know” which showed that ‘word of mouth’ was quite effective for TVXQ. Also, the majority of the fans were deeply interested in Korea with one fan visiting Korea 40 times. 76.3% of survey takers were interested in K-POP other than TVXQ. 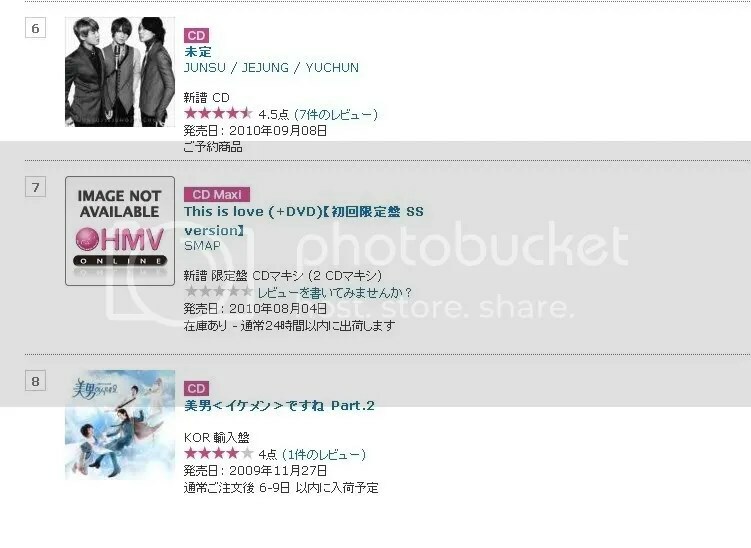 According to data from HMV Japan, many people who buy TVXQ related goods also buy goods by (in order of quantity) Shinhwa, Big Bang and Arashi. This was backed up in the survey when many said that they also liked Big Bang (15.5%), Super Junior, SS501, SHINee and other K-POP idol groups as well as Japanese artistes such as EXILE and Arashi. For the question “What is something you cannot live without, almost as much as TVXQ?” in the free response section, many showed interest in music (24.0%) with answers like “iPod”, “K-POP”, “Live” while others showed their interest in Korean culture other than K-POP with replies such as “Korean” and “Korean food”. It may be because of the fact that the information exchange between family and friends has improved, but some fans were seen writing “Family” and “Friends” as well.